Seems playable to me. Delver style decks for sure can use this, and I can imagine it taking the place of Spell Pierce/Snare based on the meta at any give time. Also dodges MM which I think is of untold value right now. I'm thinking infect were you're forcing a stack fight in the attack step or defending in the second main when they're trying to avoid just that. On second thought I doubt this is actually good. But my first thought was Merfolk or Humans, something with a ton of creatures and Cavern, with this for backup to cast something ending like a True Name. The fact that you can't Raid on your opponent's turn is huge, right? I'm not a Delver master but I feel like I'm using Spell Pierce / Spell Snare on my opponent's turn maybe 7 or 8 times more often than on my own. 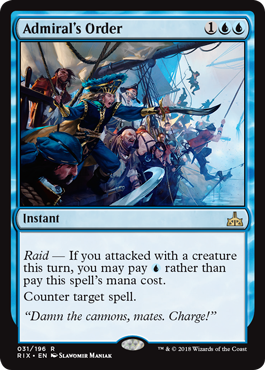 This card gets better in the late game when you can afford to pay 1UU, but I don't know that Raid is going to trigger often enough (lined up with you wanting to counter something during your postcombat main) to make it better than a vanilla Counterspell, nevermind a Mana Drain. @brass-man I agree. I could see this getting played in Standard or Modern if you had an aggro/combo style deck, since your other counterspell options there all have different pros and cons. But in eternal? This card is probably worse than Stoic Rebuttal. Its way better than cancel though. I'm glad the bar is being raised for hard counters.